Scientists have had a hard time understanding how the Arctic Ocean’s ecosystem works, stymied by the region’s ice cover and remoteness, said Griffith, an MIT/WHOI Joint Program graduate student. Now he and colleagues have published the first baseline measurements of carbon levels from the sea surface to the seafloor in the polar ocean. 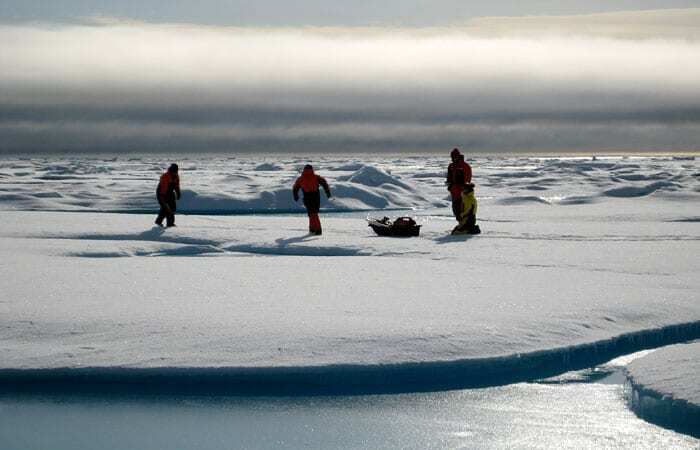 The new data, published May 2012 in the journal Biogeosciences, provide an important reference point to help researchers better understand how carbon cycles through the Arctic ecosystem and how the ecosystem will respond to rising global temperatures. Aboard the Canadian Coast Guard icebreaker Louis S. St. Laurent in 2008, Griffith and colleagues gathered organic carbon particles and carbon dissolved in seawater from 24 depths, ranging from the surface to the seafloor roughly 12,500 feet (3,800 meters) below, in the Canada Basin northwest of the Canadian coast. 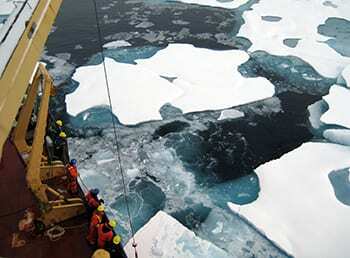 Collecting samples at those intervals was necessary, Griffith said, because the Arctic Ocean is separated into distinct layers of water, each with its own unique carbon characteristics. Ann McNichol, a WHOI senior researcher, analyzed the samples at WHOI’s National Ocean Sciences Accelerator Mass Spectrometer Facility. The instrument measured amounts of different carbon isotopes in each specimen, which helps determine where particular pools of carbon came from, how old they are, and how the carbon may have been used and chemically transformed in the ocean. As the Arctic region gradually warms, more carbon-rich runoff from melting permafrost and eroded soils could end up in the ocean. Bacteria might use the carbon as food, creating carbon dioxide (CO2) as a byproduct and adding more of this greenhouse gas to the atmosphere. Alternatively, the carbon might spur the growth of phytoplankton that use dissolved CO2 and eventually transfer excess carbon to the seafloor, effectively removing it from the environment. This research was funded by the WHOI Arctic Research Initiative, Fisheries and Oceans Canada, the Canadian International Polar Year Office, and the U.S. National Science Foundation. Also collaborating on the study were scientists from the Institute of Ocean Sciences, Fisheries and Oceans Canada, the University of British Columbia, and the Swiss Federal Institute of Technology.